Today begins the Mega JustRite Font Blog Hop and with 54 designers sharing ideas it continues through tomorrow as well. Be sure to read through to the end of my post. Tons of links are shared as well as info on the week long Font Sale at JustRite and some fun Blog Candy offerings. Now, on to my project. I have a lot of photos, so I’ll be brief with my words. 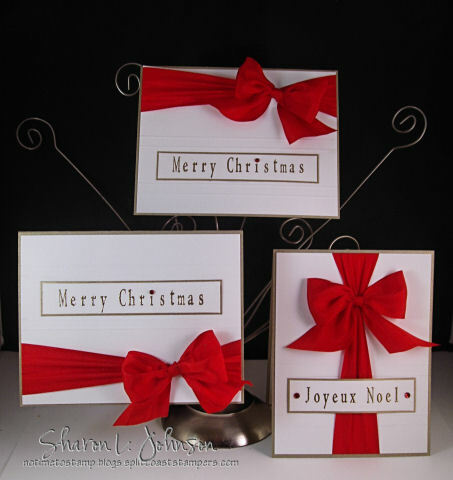 A trio of Christmas cards — Stamped Simply — using both Times New Roman Uppercase Font and Times New Roman Lowercase Font on the Harmony Rectangle Stampers. I feel it’s best to keep projects simple for the holidays. These cards were a pleasure and a breeze to make. What a feeling of accomplishment when they go together so quickly. Here’s a visual of what I used — Times New Roman Font Uppercase and Lowercase on the Harmony Rectangle Stampers. I’m loving these 2 sentiments for this style of Christmas card, so I’m sure I’ll be leaving the letters in tact for some time yet. I’m blessed to have several stampers — something you may want to consider, too, especially now when they are on sale! My sentiment is gold embossed, outlined with a gold leaf pen (I actually use a Calligraphy Pen by Marvy Uchida — it’s my latest favorite gold pen — the tip is a bit smaller than some). My sentiment is then nestled between rows of double embossed lines. A similar card in a vertical orientation. Note here how the sentiment is only adhered on the ends, allowing it to rise up over the ribbon — kind of a nice touch, I thought! Kaiser rhinestones are used to add some glitz. My Red 100% Silk Ribbon by May Arts is tied in my favorite fun and flirty fashion with the Bow Easy. You can read this post to see how it is done. This card is the same as the first, just reversed with the ribbon at the bottom. Can you see how I’ve lined the insides of the cards in pure white? I like an inside that is easy to write on and also easy to read. The card itself is Gold Brushed Metallic paper. To emboss the double lines in my cards today, I used my Scor-It Mini. I left a 1″ space for my sentiment to be placed and my double lines are 1/4″ apart. 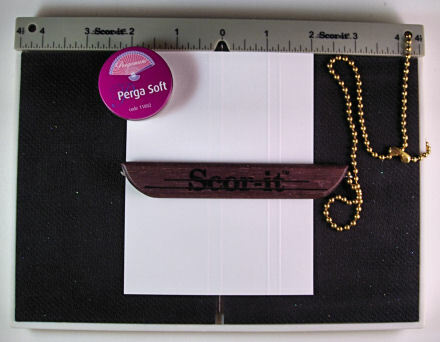 If you use a Scor-It, using the Perga Soft on your scoring tool tip helps the tool to glide over your paper. It feels like you are gliding over butter — totally effortless. I have a hard time taking pictures to get the embossed lines to show up as they do IRL. That’s what I’m trying to show you here. I really like the depth of the embossing when using a Scor-It. 1) People think they can’t draw a straight line so they couldn’t use a gold leaf pen. WRONG! The pen tips are soft, like a marker. You push the tip into the paper, starting at one corner, and draw the pen towards you with just a tiny bit of pressure. The paper forms sort of a groove in the tip and the line comes perfectly straight. It truly could not be more simple — if you haven’t done this, give it a try. An easy way to dress up a simple project. 2) Another common question — how do you get the sentiment so straight on that small piece of paper. Well, I don’t — LOL!!! I don’t stamp on a small piece. I stamp on at least a 1/4 sheet of paper. Once your stamper is loaded with letters and ready to go, line up the bottom edge of the Rectangle Wood Stamper with the bottom edge of the paper so it’s nice and straight and stamp there. Now your sentiment will be straight with the bottom of the paper, so now you can easily trim it down to size on your paper cutter. If you were using Nesties to cut your sentiment, then it would be of no concern — but today I was cutting my sentiments myself on the paper cutter. 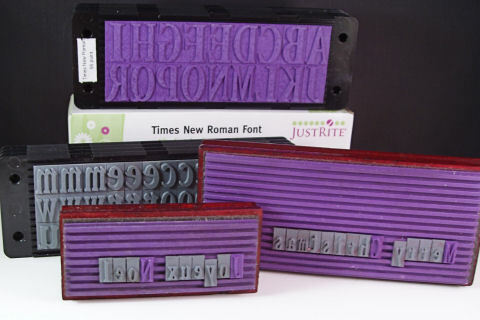 JustRite Stampers has the Font Sets I used today, Times New Roman Uppercase, Times New Roman Lowercase and the Harmony Rectangle Stampers, as well as their entire Font line on sale for one week. Take advantage and pick up some extra Harmony Rectangle Stampers as well! 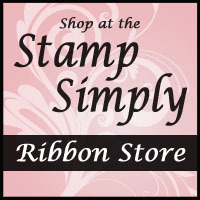 Stamp Simply Ribbon Store carries the 100% Silk Ribbon by May Arts in 21 colors, the Bow Easy and the full line of Scor-It products. JustRite is celebrating a Mega Font Blog Hop, a two day extravaganza with 54 designers, in style with a Super7 Day Font Sale. If you’re looking for some fabulous font sets, you won’t want to miss this sale, they are offering 30% off all JustRite font sets and the Horizontal and Vertical Font Stampers. The sale begins September 17th and ends September 24th. There’s Mystery Blog Candy being given away during the Two Day Just Rite Font Blog Hop!!! Why is it a mystery? Well there will be three blog candy giveaways on each day and you can only win by leaving a comment on the right blog! The real surprise is you won’t know which blog has the candy. Even the designers don’t know! So, as you visit each of the 54 designers over the two day event, take time to leave a comment. You may be one of the lucky winners! You have until 12:00 noon on Sunday to leave comments for your chance to win. You’ll want to check back at the JustRite Blog on Sunday evening to find out if you’ve won. Thanks so much for stopping in today! Truly enjoyed having you here — enjoy your Hop and I’ll be back late Thursday evening with our weekly Stamp Simply Challenge. Hope to see you then. Very, Very Elegant Sharon!!! The addition of the gold pen really adds to the elegance! 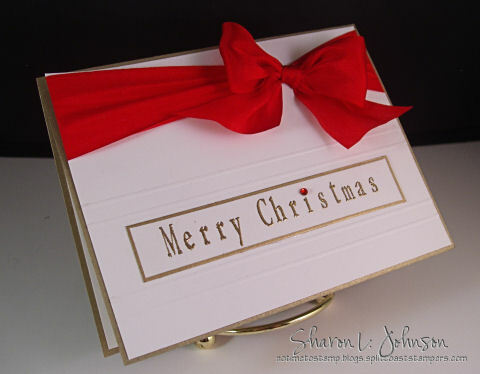 Sharon you never fail to always create the most gorgeous, elegant cards with the most stunning bows I have ever seen!!! Always inspiring to drop by your blog!! I can’t believe I am the second person to leave a comment. I am usually one of the high numbers. Love anything JustRite. Glad I am off work today so I have time to hop. It should be fun. Very pretty. Love the bows! The cards are all stunning. Very elegant! Beautiful job! Thanks for sharing. These are great and I will be using this idea, so simple and elegant. Just perfect, simple and elegant….always a winner! As ever your work would steal the show anywhere. Love Love Love these Christmas cards, so simple, so striking. These are some of the nicest I have ever seen, definitely going to make some like this, gorgeous! So classic & elegant, Sharon — I love the gold accents and touches of red! Great tips you shared, too! SO simple and BEAUTIFUL ! thanks for the embossed lines tips. i always like the look, but forget to do them. The bright red ribbons make the cards! Thanks for sharing your tips. Simple and elegant. Love them. Thank you also for the gold leaf pen tip. God bless! I love your cards. I love red and white cards. Your bows are beautifully tied. Thanks for the tip on the gold pen. I’ve been avoiding trying one since I’m straight-line challenged and using a ruler is like asking for trouble with me (can you say gold fingers and fingerprints all over?) The cards are gorgeous! The cards are so simple, but elegant. I like the bows, the red rhinestones and the score marks. A great idea! The scoring is so nice with the simplicity of the cards! These are simple but so stunning!! Just beautiful Sharon!! Love the cards, so simple but so elegant! Thanks for sharing your ideas! With the holidays just around the corner simple is best and beautiful too! These is so ELEGANT!! !I love the simplicity…they are not “over Done”. The gold embossing and beautiful red ribbon make these so striking! Thanks for sharing your wonderful talent! Your cards are so pretty! Thanks for the tips. Your cards are STUNNING! I love clean and simple. The fonts and wooden stampers from Just Rite make it so easy to mass produce a set of cards, don’t they? 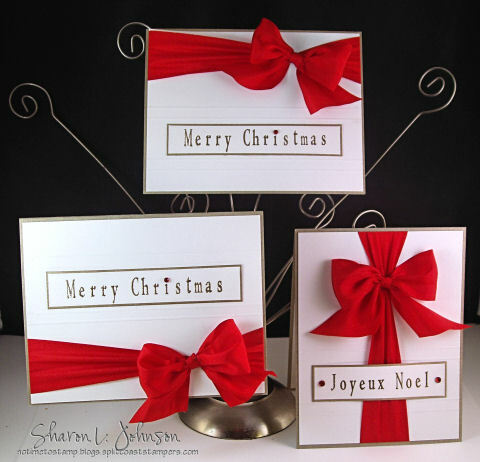 Beautiful and elegant Xmas cards. Love the scoring and bows. The simplicity of the fonts makes them easy to read for older people also. Very simple and elegant. love the embossing. Very Elegant Sharon. Your work is always so beautiful. Thanks for all the tips. My next JustRite purchase needs to be this rectangle stamper. Simple but elegant. Very prretty. I really like the clean look of your cards. Elegant is the word that comes to my mind. Thanks . I love the cards. Great use of JustRite stamps and the ScorPal. Beautiful work! I love your cards they are elegant looking, this is a MUST HAVE SET for me , Thanks so much for sharing. Simple and classy. I’m loving red and crisp white lately! I’m a red person anyway. Nice job. very classic and elegant. love this! Thanks for all the great info and your projects are beautiful!!!!!! So simple and so ELEGANT!!!! Love it!!! Elegance in simplicity! Sometimes I add too much or not enough. My boyfriend and I are making Christmas cards this year. Yes, he is going to help!!! I think he would like doing something along the lines of your design. BEAUTIFUL! Beautiful cards! Simple and elegant, love it. I always enjoy visiting your blog for your wonderful projects. Beautiful and elegant cards! 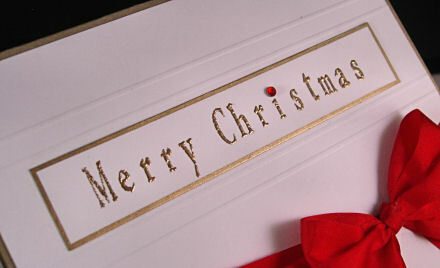 I love your simple and elegant Christmas cards! YOUR elegance is beautiful…such stunning cards, Sharon. I love every detail…and thank you for the gold leafing tip, I have to give that a try! Take good care! I love those cards. They are so beautiful, yet simple. I love that they are not so cluttered. The gold leafing is great on there. Thanks for sharing. You certainly define elegance Sharon! These are over-the-top gorgeous and rich…the silk is just scrumptious! Beautiful Sharon! Absolutely stunning! I love that red and white with the gold. OMG Sharon you did it again!! Simply Elegant cards!! 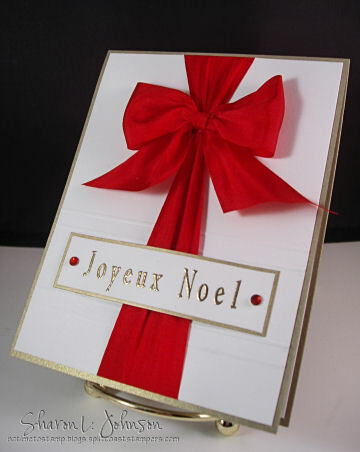 Just proves a beautiful card can be made with white and gold paper; JustRite stamps and red silk ribbon. How simple but elegant! Will have to give these a try! Thanks for sharing! Beautiful, beautiful, beautiful. I love these and thank you so much for the tutorial. These cards are perfectly stunning Sharon! love the simple look to your elegant cards. These are great, so simple and elegant. Beautiful, simple, and elegant! Wonderful projects! Oh my goodness … I love these! Great job. As always, so simple yet elegant! Thanks for sharing. Soooooo elegant, but simple! You always make things look so easy! I love the clean simple lines of your project! Very elegant! Hi Sweety! Love your cards. Try doing what you did with other alpha stamps. It would take forever! As usual, elegant and sophisticated. I love the simplicity of your cards, they are so elegant looking. Love all the great ideas I am seeing on the Blog Hop. I’m mankign out my wish list now!!!! Elegant and simple! Lovely as always. WOW! In a word: “ELEGANT!” Thanks for sharing! So pretty! I love the detail the scoring gives to the cards! Simple, but elegant. great job. Stunning! I love the red and gold together! Just got the bow maker and can’t wait to get my cards started! I so love to see your work! It is so clean,classic and elegant. Very elegant. Just stunning. Love how you used the fonts with embossing powders. These are simply gorgeous, Sharon! So elegant, so you! Do you have a special way of mailing your cards with the big bows? ooh I love those Christmas cards – sometimes it’s the simplest ones that have the most impact. Gorgeous!! Sharon, you did it again wow! So gorgeous with your lovely tied ribbon and bows! How does your bow not tend to pull or tub or warp your cardstock? I love JustRite’s Blog hops! I can’t wait to see all of the participant’s blogs.☺ I love your projects. Such class! Love the simplicity. Very elegant and classy. Loved it. Wow, these have a SIMPLE elegance! Wonderful set with the amazing red ribbons. Gorgeous! The cards are so classy. How incredibly beautiful! They are simple but elegant! As usual, Sharon, fantastic projects! 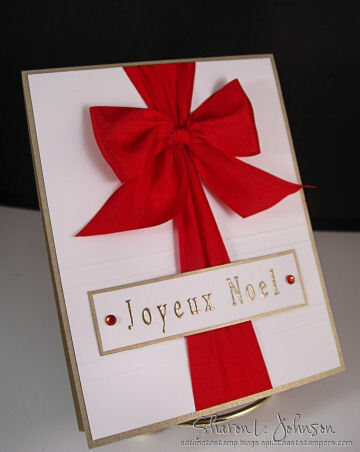 I love the simplicity of the scoring, embossing and ribbon. Love the simplicity and elegance of your cards! stunningly simple – I’ve always been nervous about trying to edge my work with gold leafing pens…you made it sound so easy. I LOVE these cards. Wow! Talk about elegant cards! I love how simple they appear, yet they have so much detail! I’m taking notes! I found elegance in the simplicity or your cards. Awesome!!! Thanks for your wonderful tips on lining up letters and getting them straight. I’m amazed at all the great ideas I’m getting on this hop. The simplicity of your cards is elegant! I love the red bling to dot your “i”s. Thanks for sharing! Sharon, I just love your work and you blog, thanks for the inspiration. What lovely, elegant cards. I would love to send or receive such a beautiful card. I truly love all of your work. I always look forward to see what you have new, Thanks so much. PS I must read all about the bow maker, as mine never want to lay the way I want them to lay. Beautiful cards Sharon. They are so elegant. Your bows are (as always) simply gorgeous. These cards are simple but oh so beautiful. Also, thank you for the detailed tips. I love these cards!!!! Simple but so elegant! Thanks for the gold leaf pen tip. I have been wanting to try them but I’m one of those people who can’t draw a straight line also. I will definitely try it. Thanks for sharing. I love the simplicity, yet elegance of these cards. These have a lot of WOW factor, without a lot of fussiness. Just love the whole concept! I love the red and white. Also love this font set. Love your Christmas cards. They are beautiful. Thanks for sharing. Lovely and classic. Thank you for sharing! Very pretty! Love the gold embossing. TFS! Your cards are so classic and lovely. I need to remember simplicity is elegant when I make my cards this year. Thank you for sharing. Great work I just got a scor pal looking forwardd to using it. I love this project. It is so simply but beautiful. Thanks for sharing. Thanks for the great tips-very elegant cards! Love the simplicity and beauty of your cards! I loved your cards. I am definately coming back to read your instructions and I liked all the info you added. Great job. elegance and simplicity-my kind of card! Cute cards. I guess I should get my Score-it Mini out and use it. WOW!!! are these ever beautiful!!!! thanks for sharing! Such classic cards Sharon- really beautiful and simple! Such a rich color combination. These cards are so elegant. Wow…I just want to open this wonderful present. This looks like it belongs in a store front window!! Beautiful and thank you for the lettering tips. SHaron, you always make the most beautiful, classy cards–love them all! 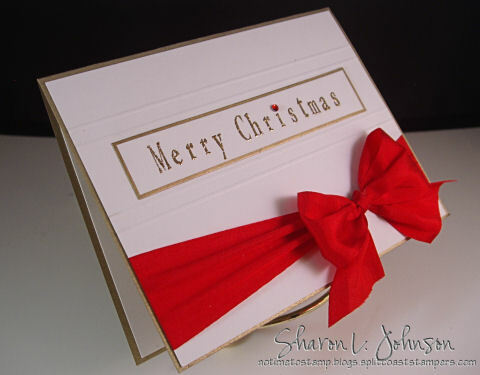 Simple elegance — perfect for Christmas cards, I think!!! Love your simple elegant cards. They are beautiful and thank you for the tip to draw the gold edges. Simple but elegant cards! Lovely! Your cards are absolutely stunning! Thank you for the inspiration! I love this font. It is just the perfect size. Very elegant cards. great idea – very elegant looking! Very clean and simple. I like it! Love, love, love these cards. So elegant. I hope you don’t mind that I put a link on gingerwood so that everyone could come and check them out. 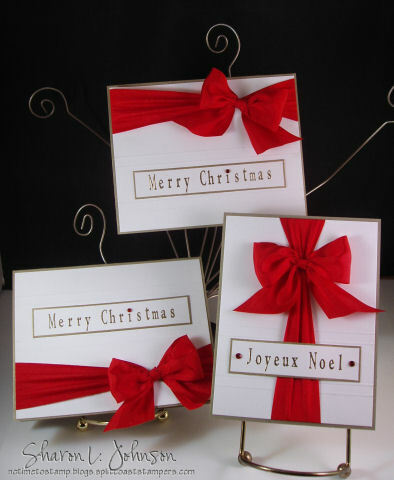 Beautiful cards–they look like big gift boxes just waiting to be opened! Love the simple elegance of your designs. Thanks for the inspiration. As always your cards are just beautiful! Very elegant – thanks so much for all your great ideas! WOW – simply ELEGANT! Clean and crisp, bold and exciting! thanks for shraring! Thanks so much for the instructions on these beautiful projects. It is really appreciated! These are striking, now I must have a gold leaf pen, hehe. So nice. Love the clean crisp look. So simple, yet so elegant! You make such beautiful cards! I love the simplicity and the elegance of these cards. You always WOW me. Wonderfully done Sharon — as always!!!! I love the use of score lines! Very pretty. Short and sweet – Beautiful, Simple, Elegant. These cards are just that! Very simplistic yet so beautiful. Thank you for your tips. How simply elegant. Just love the cards. Thanks for sharing. I love the bold red with the simple card. Beautiful! What a simple yet elegant card. I have been using my bow easy to make bows for my cards also. Thanks for the great ideas. Simple But Beautiful. Sometimes you just gotta hear the Quiet! Great job with the cards. Makes me want to go do some embossing. Love the simplicity and elegance of your cards.. So simple yet very elegant! Thanks for sharing. The simplicity of these cards is absolutely stunning – I would be so proud to send these cards to any of my friends and family. They are just glorious! Understated elegance, I love it! So sweet and clean. Less does say more in this card. Very elegants cards, thanks for sharing them. So stunning and yet simple. Thanks for all your great ideas! I absolutely Love these!! Thanks for the tip on the gold leaf pen. Beautiful and elegant. That silk ribbon is just amazing. such a clean and quick card! love it! Thanks for sharing! Loved the embossing lines glad you showed us how to do them! What a beautiful Christmas Card. So simple but so elegant. Stunning cards! The simplicity of them makes them that much more beautiful! TFS! Thanks for such inspiration! As always, LOVE LOVE LOVE your work!! Sweet and simple but oh so elegant. Great job! What elegant and simple cards…beautiful. WOW how classically elegant – love these cards, they are so …. beautiful. The fonts ‘say’ it all. Simple and elegant–a winning combination for sure. All just gorgeous, Sharon. That bow is stunning against the white of the card. I really love the way these turned out. Wow Sharon I love your cards! Their so elegant and simple, that red ribbon really finishes them off. Your cards are so beautiful and elegant – thanks for sharing! These are so professional-looking, Sharon!! I love your embossed lines, touches of bling, and perfect bows!! The embossing makes your beautiful creations simple and elegant. Thanks for sharing! These are so beautiful! Very sophisticated. Absolutely gorgeous, Sharon….you always make it look so easy!!! The cards are elegant. 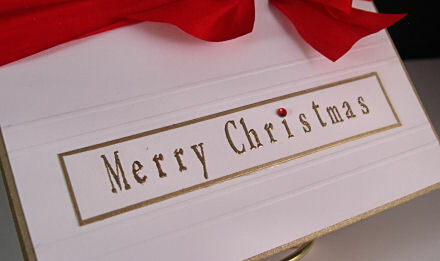 I LOVE the simple elegance of your cards – the gold and red is just stunning! And …. who’d’a thought — emboss!!! Just like “regular” (!!) stamps! These are beautiful … and the bows are to die for! 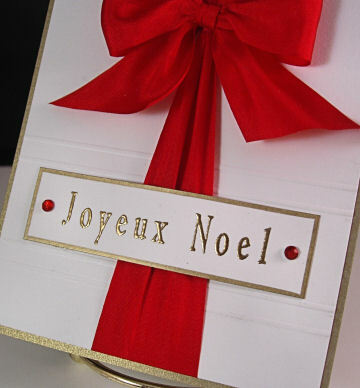 I just love the crispness of the white with red ribbon. Very nice as always. Wonderful cards so simple and neat looking. Thanks for sharing and also your tips at the end too were great. Phyllis M.
Beautiful! SO simple but those velvet bows really do it! What beautiful card. So elegant looking. So Elegant!! Thanks for sharing!! Such pretty projects. Thanks for sharing! Love your bows and the fast and simple cards- I need to go buy the lowercase letters while they are on sale! “You made fantastic nice points here.